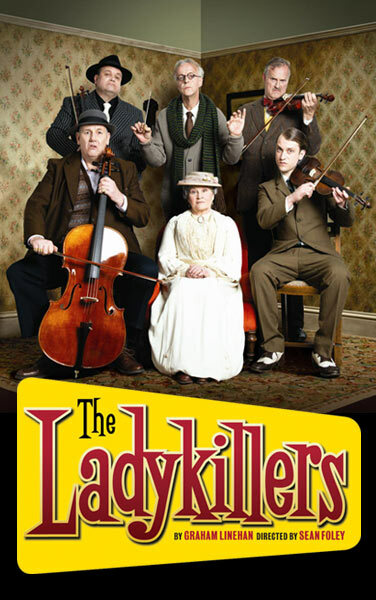 Graham Linehan’s stage adaptation of the classic film comedy is an unadulterated joy from start to finish. The first aspect of this production that strikes you is the marvellous, higgledy-piggledy set, designed to show several rooms in Mrs Wilberforce’s railwayside house. Walls and doors lurch at bizarre angles like something out of a German expressionist film – or flatpack furniture put together by yours truly. It soon becomes apparent there is a reason for this crooked house: subsidence, but the kooky nature of the environment is the perfect setting for the crazy, off-centre characters who inhabit it. Designer Michael Taylor provides plenty of surprises in his detailed and versatile creation. Michele Dotrice heads the superb cast as lovable old dodderer, Mrs Wilberforce, who rents out a room to what she thinks is a string quintet. She potters around, oblivious and vulnerable and yet somehow commanding. It is easy to see how the ne’er-do-wells are reluctant to bump her off. The crooks are masterminded by Professor Marcus (Paul Bown) who is deliciously sinister and ingratiating. As neurotic Major Courtney, Clive Mantle channels John Cleese (and Danny LaRue! ); Chris McCalphy is consistently hilarious as dim-witted oaf One Round; Shaun Williamson impresses as Romanian hit man Louis Harvey; and William Troughton’s Harry Robinson is a mass of pent-up energy, guzzling pills and being hit in the face more times than I could count. Marcus Taylor’s Constable Macdonald lends solid support, worldly wise and yet blinkered at the same time. Each character is well-defined, albeit in broad strokes as befits the farcical situation. It’s been a long time since I’ve seen the film but I think I can spot updates in the script and Linehan interpolations. The ‘buggers’ are the more obvious contemporary additions. Purists may baulk but the language adds to the incongruence of the hoodlums in the sweet little old lady’s home. The new lines lend darkness to the piece that would be created by other means on film. What we get here is an undoubtedly theatrical piece, with a rich vein of dark humour that reminded me of Arsenic and Old Lace in more ways than one. Sean Foley directs the ensemble with gusto, keeping the pace going, embracing the silliness and encouraging the larger-than –life. There is an amusing representation of the heist with model cars driving up a wall, and a good deal of physical business to keep the actors occupied. The show is a well-oiled machine but feels absolutely fresh, inventive and funny.